Collect 135 frosty new cards in newest expansion for Blizzard Entertainment's internationally acclaimed digital card game. Legendary Hero Cards transform Hearthstone's fallen heroes into powerful Death Knights with game-changing new abilities. Overthrow the Lich King and claim the Frozen Throne in a series of free missions. As the cold shroud of death falls upon the land of the living, Azeroth's mortal inhabitants shiver with fear - Knights of the Frozen Throne, the new expansion for Blizzard Entertainment's smash-hit digital card game Hearthstone, has arrived. The Lich King - Lord of the Scourge, master of Icecrown Citadel, and wielder of the cursed runeblade Frostmourne - has come to conquer the tavern and those within it, promising power in the form of 135 frosty new cards. Knights of the Frozen Throne takes players to Northrend, where they'll meet an untimely demise, only to be raised by the Lich King and granted terrifying new powers from beyond the grave. Adventurers can harness this unholy might by collecting nine new legendary Hero Cards that, when played, transform the heroes of Hearthstone into fearsome Death Knights. Those with the will to rise against the Lich King can embark on a series of challenging missions that Knights of the Frozen Throne offers to everyone—for free. Players who enter the icy halls of Icecrown Citadel and complete the prologue shall receive a random Legendary Death Knight Hero Card before battling through two wings guarded by iconic bosses like the pestilent Professor Putricide and Blood Queen Lana'thel . . . until only the Lich King stands between them and the Frozen Throne. 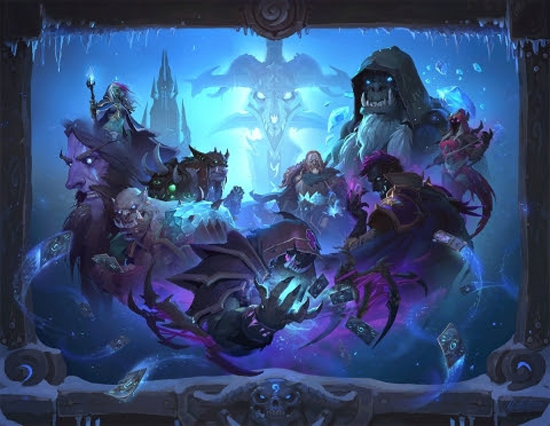 "The Lich King is one of our most iconic villains, and we're excited to finally bring him—and his nine new Death Knights—to Hearthstone," said Mike Morhaime, CEO and cofounder of Blizzard Entertainment. "Whether they're ascending the Frozen Throne or dueling with friends at Fireside Gatherings, we can't wait to see how players wield these deadly new cards." Knights of the Frozen Throne is available now for Windows and Mac PCs; Windows, iOS, and Android tablets; and iOS and Android phones. Card packs can be purchased individually or in discounted bundles from the in-game Shop for gold or real-world currency at the same price as all other Hearthstone card packs. Players now have the chance to win Knights of the Frozen Throne card packs as quest rewards or prizes in the Arena, and can also craft cards from the expansion by using Arcane Dust collected from disenchanting unwanted cards. Players who log in by November 1 will receive three free Knights of the Frozen Throne card packs* to aid them as reinforcements arrive to storm Icecrown Citadel.